Back in the late 1990s, I went to an art and design school called Columbia College. It was located in Chicago’s South Loop neighborhood, the southern part of downtown. Everything was expensive; only the really rich (business men, doctors and lawyers) or the really poor (college students and homeless people) lived downtown. I was always looking for cheap forms of entertainment. 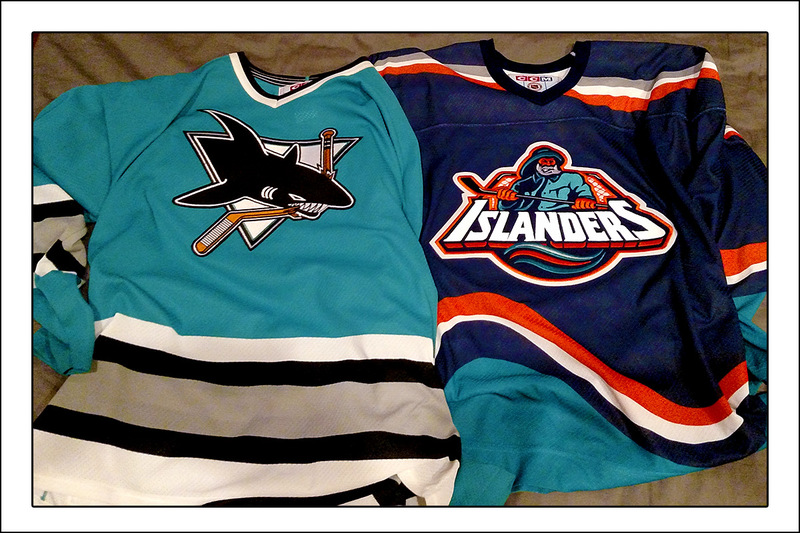 One day, that cheap thrill was getting an Islanders “Fish Sticks” jersey on clearance! 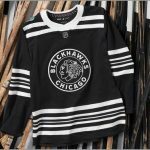 About 1.3 miles (2.1 km) north of the Columbia College dormatory was “HawkQuarters,” the official team store of the Chicago Blackhawks. This was a decade before the team would rename it “The Blackhawks Store.” Boring! Anyway, every year when I started school, I would make the walk to HawkQuarters and see what inexpensive hockey swag I could score. The shop would sell team photos from the current season for $5, but last year’s team photo for $1. Likewise, 8″ x 10″ photos of players who had been traded away were $1, and old media guides were a few dollars each. Minimally, I would go to get a copy of last year’s team photo for a buck. 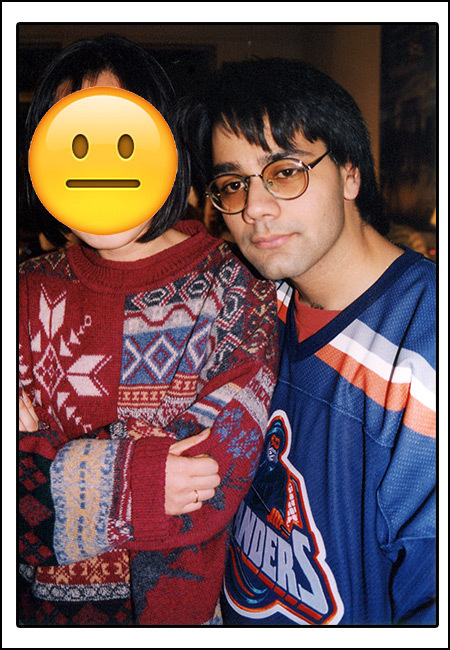 In September of 1998, I was on my annual sojourn to HawkQuarters when this beautiful creature caught my eye: a navy blue New York Islanders “Fish Sticks” jersey, called such because the logo looked like the fisherman from the package of Gorton’s fish sticks. The “Fish Sticks” jersey is so bad, it’s awesome. It neatly encapsulates everything that was wrong with hockey jerseys in the 1990s, with its goofy logo and wavy lines and unnecessary use of teal. And I love teal — but only when done tastefully. 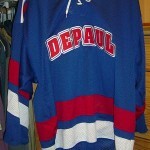 This jersey debuted in the 1995-96 season. Isles’ fans hated it. 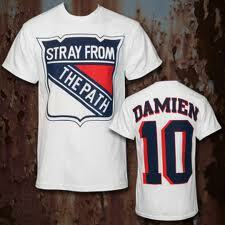 Heck, pretty much everyone derided that jersey. 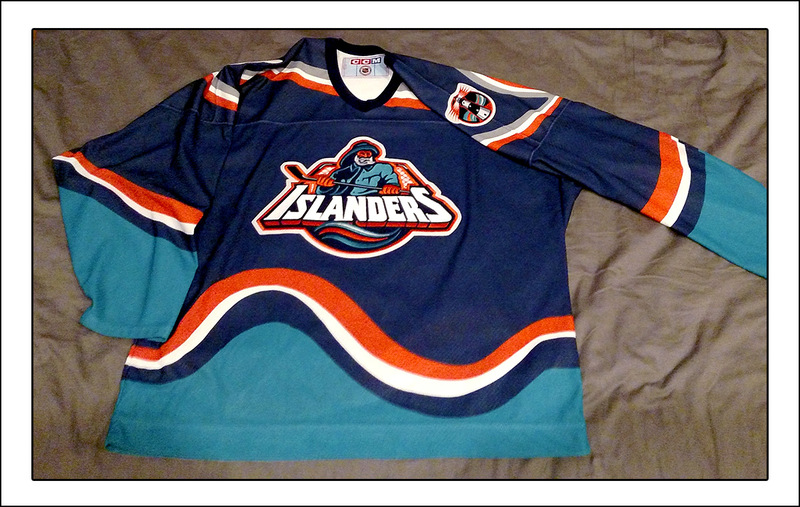 So the next year, the Islanders started to phase out the “Fish Sticks” logo, and by 1997-98, the old fisherman was gone. So getting this jersey in the fall of 1998, almost three years after the team stopped making them — and in Chicago, no less — was quite the find. Plus, it isn’t like these were produced in the same numbers as, say, Blackhawks or Red Wings jerseys. I grabbed the jersey, and checked its size: extra large — perfect! It was an air-knit, replica-weight jersey, and it was marked down to $30. At the time, a brand-new replica jersey would sell for $60 to $75, so $30 was a steal. 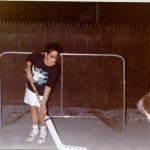 Even better, HawkQuarters also had a teal San Jose Sharks jersey — the best use of teal ever! — marked down to $30. It was also an extra large, so I grabbed that one too, and hurried over to the checkout. And so I did. I was a cash-strapped college student, living off of student loans and my $5-an-hour job working in the school’s computer lab. Every pay period, I would hike back to HawkQuarters and put down $5, $10, whatever I could. For a little while, I didn’t make a payment, and someone at HawkQuarters called to remind me; I remember the clerk being pissed because I was taking way too long to pay this off. Eventually, I got these awesome hockey sweaters out of hock. 1998: My date said the “Fish Sticks” jersey was ugly, but look at what SHE’S wearing. After that, “Fish Sticks” wasn’t just buried in a drawer or in the back of a closet. Oh no. I’d wear that sucker. At an art school, circa 1998, the unofficial dress code was either a band t-shirt (Pearl Jam! Weezer! Marylin Manson! ), tie-dye, flannel or anything grubby, grungy or ironic. Or any combination thereof. I probably looked like some confused tourist, trudging off to my cinematography class in my Islanders jersey, army surplus pants and brown work boots. I also wore “Fish Sticks” to college parties because the last thing a party needed was another guy in a “Take Me Drunk I’m Home” t-shirt. I remember a girl that I was dating at the time telling me that the jersey was “ugly.” I guess she didn’t see the appeal of an orange-faced fisherman wearing a teal rain jacket and wielding a hockey stick. Women! But my roommate Dave loved the “Fish Sticks” jersey almost as much as I did. My friends and I would sneak into the workout room in the dormitory’s basement at 2 a.m. for some pickup floor hockey. Dave played goalie, and frequently donned the “Fish Sticks” sweater. 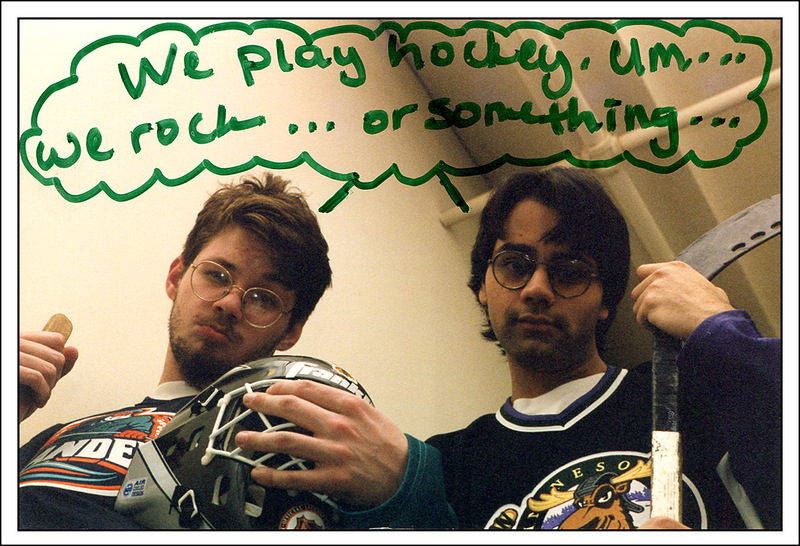 1998: My college roommate Dave and I about to play some dorm hockey at 2 a.m.
Dave would also wear “Fish Sticks” when we went to Chicago Wolves games, as I would unironically wear a Wolves jersey to Wolves games. But Dave wasn’t wearing the Isles jersey just to be ironic; the Wolves were partially affiliated with the Islanders, so it wearing it to the games was technically correct — the best form of correct. Band T-Shirt: Clever or Copycat? Awesome jersey Sal, and even better post! Sal, I’ve been an Islander fan since the team came into the NHL 1972-1973 as a fan I never heard anybody say “Hey Fishsticks get a real jersey”. I feel that when the Rangers changed nobody gave them a hard time. So when I wear my Fish Stick jersey I still smile and the tradition lives on. I also say see you at the STANLEY CUP. Thanks for reading, guys. Glad you didn’t find my reminiscing about my college days as boring. Great post. I wore a white fishsticks jersey to the 2015 entry draft in Sunrise Florida. I was accompanied by my 15 year old daughter and my 24 year old son. My kids were utterly unaware of the history behind the Gorton’s jersey. They were shocked when people in the arena called out to me “hey fishsticks” or gave me thumbs ups for no apparent reason. It was quite the thing. I don’t have it to post right now, but I got a snapshot of me in the jersey with Bill Torrey who was attending the draft. I also had to explain to the kids my excitement about getting a picture with this hockey genius. 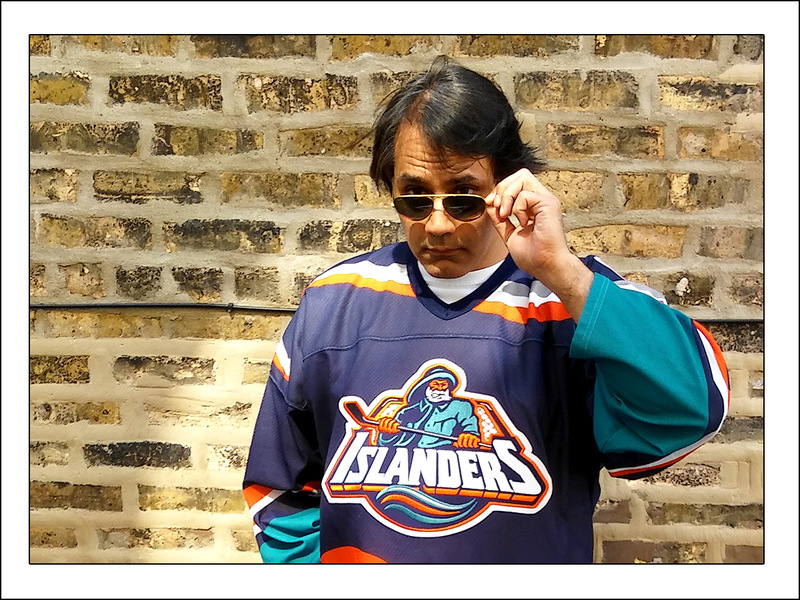 Anyway – thanks for the post about your fishsticks jersey. Cool story, Darrell. I wonder what Bill Torrey thought about the “Fish Sticks” jersey. WE want FISH sticks! Clap! Clap! Clap-clap-clap! At the time these uniforms debuted, I still lived on Long Island and still followed the NHL (although I was a Caps fan). I can tell you that Rangers fans LOVED the fishsticks jersey… because it gave them additional ammunition in the war between the two team’s fans. Me, I couldn’t say too much because at the same time my Capitals had switched to the blue/bronze/black monstrosities that, to this day, makes me want to spit on the ground. 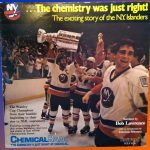 While Long Island does have a long history of people who plied their trade on the water, I doubt that many Long Islanders identify with that history, and that was one of the bigger problems with that rebranding… But I think the biggest reason for the backlash was that it went away from the uniform that the team wore while winning four Stanley Cups, and it was perceived as change for the sake of change. Anyway, just thought I’d share my own recollections of the period. Enjoyed the post, and I’m glad you enjoy your jersey. LOL, yes, the Swooping eagle Caps jersey. I kinda liked it, actually, though I wish they didn’t change the team’s colors. The Eagle made for a better logo, I think, than the Capitals word mark. But the red, white and blue worked so much better. Nice score on the Isles Jersey. I have the same appreciate of it that you do and always had. I didn’t think it was nearly as horrible as people made it out to be (the Kings “Burger King” jersey on the other hand…). While I wouldn’t be caught dead wearing it (As a lifelong Pens fan, I have a special hate for the Islanders and especially David Volek) in public, you can mark me down as someone who always wanted to get one and hopefully will at some point. You just can’t beat the colour scheme and the totally 90’s approach. Every time I see one, I feel like I am 12 again! It’s funny how you mention those as a “Gorton’s jersey”. Up here in Canada we always called it a Highliner jersey because it looked like it would a non-plagiarized version of Captain Highliner off a fish sticks box which is the same idea (we don’t get Gorton’s here). BTW nice Moose jersey in the last photo! Thanks for noticing my Minnesota Moose jersey. If the jersey was goofy looking, I had to have it, and a moose wearing a hockey helmet is also pretty damn funny. Agreed! 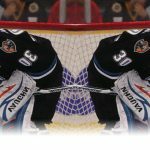 I always found the Minnesota/Manitoba Moose jerseys to be some of the goofiest, yet best jerseys in pro hockey. Isles gave them out this past year to season ticket holders and as a come on for sales to groups of 10 or more. They never won when I wore it. Haha, I don’t think the Isles won when *they* wore it, either. Not a reminder about which I like to think. One day, I’d like to get a name and number on this jersey. But there were no good Isles on the team at the time. Maybe Ziggy Palffy? He’s about as good as it got. The memories are too painful, I must say.